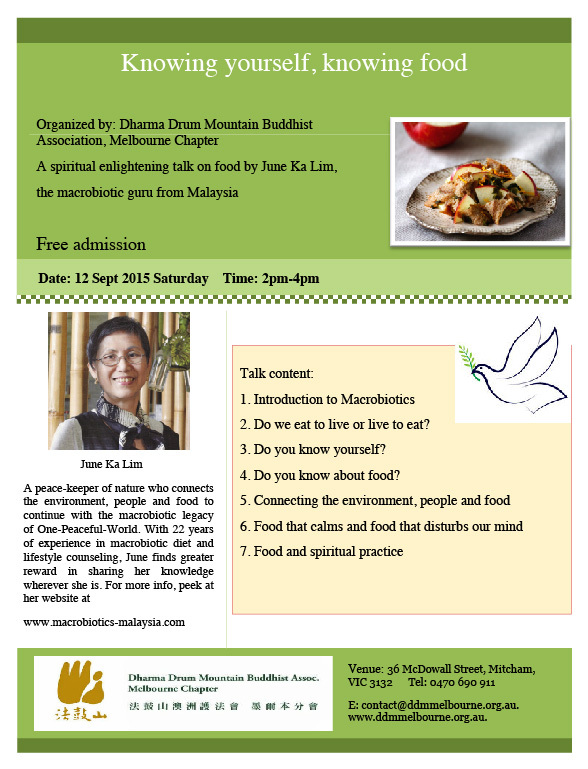 This information session by June Ka Lim starts with an introduction to macrobiotics. The word "macrobiotics" is Greek in origin. Macro means great, bio means vitality and biotics means the techniques of rejuvenation. A macrobiotic diet contain a lot of vegetarian food, so it is suitable for vegetarians and even vegan. This makes it an ideal diet for Buddhists and is also good for your health. If you are into eating right, caring for the environment, and vegetarian/vegan diet come along to find out more about a macrobiotic diet compatible with your Buddhist beliefs.